Founded in 1820, Columbia has grown to a community of over 10,000 people. The City is located 11 miles south of downtown St. Louis, directly east of the Mississippi River. 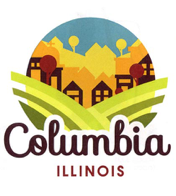 Columbia is situated at the intersection of Interstate 255 and Illinois Route 3 and is also served by Illinois Route 158. These major thoroughfares provide access to nearby Interstates 55 / 64 / 44 / 70. These access points make Columbia a great hub for business or a company with distribution needs. Columbia is also home to a small airport, Sackman Field, and a State-certified Historic Mainstreet.